McDonald’s Korea invited female employees to its International Women’s Day event to recognize their contributions to the company, it said Friday. The event, held Wednesday, spotlighted some 20 female workers at McDonald’s across Korea, including mothers and daughters working together at the fast-food chain. The women were invited to the company’s headquarters in Jongno-gu, Seoul. Chief Executive Officer Cho Ju-yeon oversaw the occasion. Cho said McDonald’s seeks to eliminate discrimination against gender, age, education and disability in its hiring process. “We will strive to create a corporate culture in which diversity is respected and competent female workers can freely test what they are capable of,” Cho said. McDonald’s Korea has over 1,700 female workers, some 300 senior workers and more than 200 staff with disabilities. 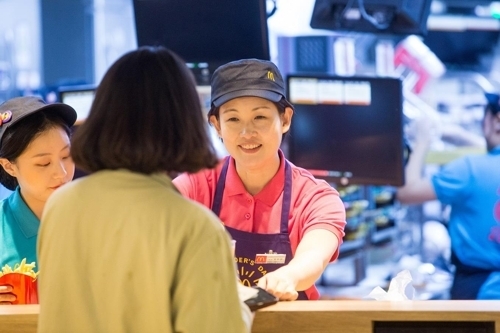 Over 50 percent of McDonald’s Korea’s entire staff are women. Female employees make up 35 percent of employees at the Seoul headquarters. International Women’s Day was celebrated Friday.